Gucciâ€™s creative director has famously transformed the fashion house without disregarding the brandâ€™s history. He isnâ€™t afraid to mix the old with the new, often incorporating vintage logos and archival equestrian-inspired details into new designs. 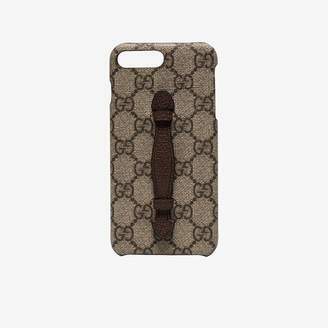 Crafted from leather and canvas, this beige neo GG print iPhone 8 plus case features a finger grip handle and a monogram pattern.